I had already heard some great things about this movie, and “Frank” definitely lived up to my expectations. One of my favorite things was how after about half an hour, I thought that I had the movie figured out, only for it to take a completely different – and in my case unexpected – turn. I should point out that I hadn’t even seen a trailer, thus going in almost completely blank, only knowing the most basic premise – which might have helped to make the direction that it ultimately took such a surprise for me. Thus, if you know more about it upfront or you simply see it coming sooner, “Frank” might not quite delight you as much as it did me. I’ll be damned if I’d spoil the surprise (?) for you, but let’s just say that I really liked the way “Frank” deals with ambition. Of course, the things that the movie have to say about that are not particular profound, let alone new, but still, I liked the tragic turns the movie ultimately took. Before things take a turn for the worse, though, “Frank” is a very funny and at times quite exhilarating movie. I loved it’s depiction of the creative process. I also really liked the idea of a guy who has this fake wooden head on all the time, as well as the design of the head itself. The idea as well as the execution have something very surreal and strange. You feel kinda uncomfortable because you don’t see his facial expressions, something the movie addresses head-on (no pun intended), and I thought it was really interesting and quite revealing to see how much of our communication relies on actually seeing the other person (which is why irony seldomly works online). The music was really great too. Very strange and unusual, and it took me a while to really get into it, but ultimately, I ended up liking most of the songs. Finally, the performances were really great. 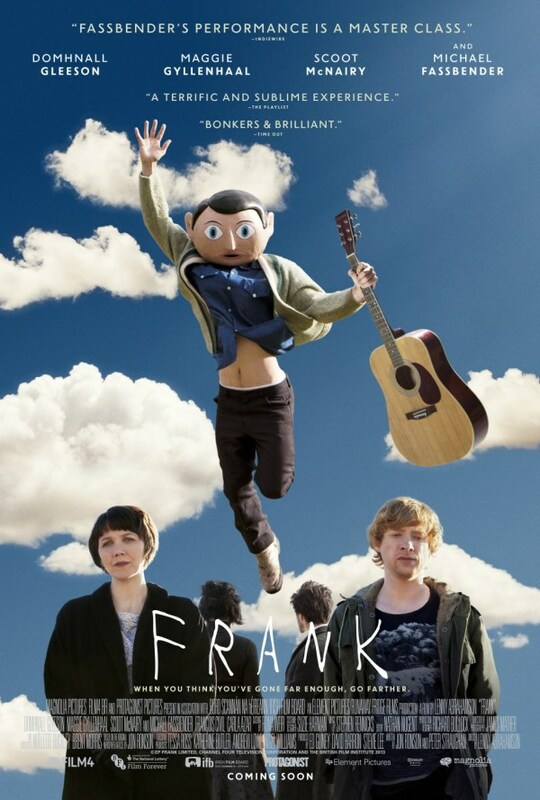 Michael Fassbender manages to give Frank a personality and a humanity just with his voice, and I also really liked the ever-reliable Maggie Gyllenhaal as well as the increasingly impressive Domhnall Gleeson. So all in all, I had a really good time with “Frank”. This entry was posted in cinema 2014, movie reviews, Viennale and tagged Domhnall Gleeson, Frank, Leonard Abrahamson, Maggie Gyllenhaal, Michael Fassbender, Viennale 2014. Bookmark the permalink.